Every one of us has do deal with the occasional financial emergency. If you haven’t had a financial emergency rear its ugly head, just wait, it WILL happen. Sometimes an emergency is beyond your control. That could include car accidents, storm damage to your home, or a health crisis. But sometimes they are easily preventable if you decide to be proactive. For instance, needing to replace the 30 year old roof on your house is not an emergency. Roof replacement is something you should be preparing and saving money for over many years. Anyway, when you do have an emergency, there are several things you can do to help keep that emergency from ruining your finances. 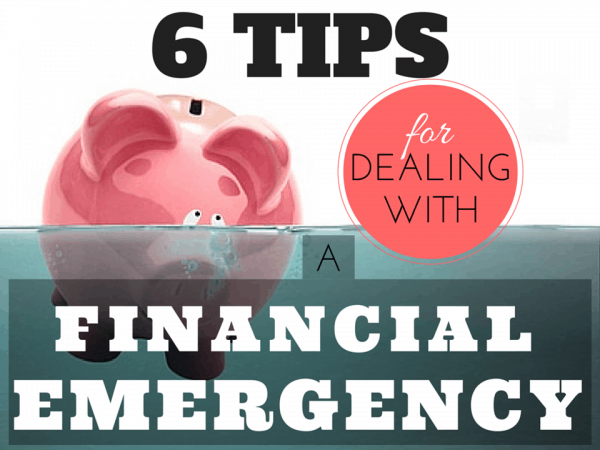 In this article I’ll show you 6 tips for dealing with a financial emergency, how to prevent one even before it happens, and hook you up with some great resources. When a financial emergency comes your way, it’s easy to lose your perspective. That can cause you to make poor decisions that can have long term consequences. But if you follow these tips, you can minimize the damage to your finances to get through your emergency as quickly and pain free as possible. One thing that so many people do when they have a financial emergency, is panic. It’s easy to get caught up in the emotion of your situation and make a stupid financial decision that has a long term effect on your finances that can be hard to overcome. So the first thing you should do in a financial emergency is- don’t panic! It may be hard to do, but try to look at the situation without all the fear and other emotions that come with it. Calm down and think rationally about how to deal with your situation. Then make sure you understand how any decision you make will affect your future. If you’re not sure what to do, find someone wiser than you and seek their counsel to help make the best decisions possible. If you have debt- pay secured debt, such as mortgage and car payments, before paying unsecured debt such as credit cards. As always, I recommend a written budget for your money, even when you’re not going through an emergency. You can read all my posts on how to budget at this page and get free printable budgeting forms too! Also, check out my book on budgeting here. If you know you will have trouble paying your bills because of your emergency, contact your creditors and service providers immediately. Many people have a tendency to put this off, which results in tons of late fees and nasty telephone calls from creditors. Some credit card companies are willing to defer payments for awhile, or work out alternative payment options. If you have student loans, you can also get deferred payments for a period of time. Utility companies have programs available to those having trouble keeping up with their bills. Call them to find out what options they have available. If you still have a job, you may qualify for mortgage modification which can lower your payment significantly. Remember, don’t put these off if you need help. The sooner you contact your creditors the better. Obviously, if your emergency puts a huge dent in your finances, you will need to cut your spending as much as possible until you recover. Like I mentioned above, that’s where a good budget comes in. Use your budget to prioritize spending and stop wasting money on things that aren’t totally necessary until you get back on your feet. This is one of the best things you can do to pay off expenses for an emergency. I also highly recommend it when you’re trying to get out of debt. Making extra money accelerates the time it takes to pay off any kind of debt, and allows you to deal with emergency expenses for a much shorter time than if the extra income was not available. Sometimes you just can’t do it all by yourself. Reaching out for help can be a hard thing to do, but it’s ok to ask for help when you need it. There are many programs to help people in need, and they can help with most anything such as food, transportation, rent, mortgage payments, medical debt, utilities, and more. As a matter of fact, I saw this kind of help work first hand when the tenant in my rental house lost her job. She was able to get her deposits and first and last month’s rent paid by a local community organization. She has been a great tenant and has never been late on her rent since. I know she’s very grateful for the help she received. Make sure you are financially prepared for an emergency before it happens! Start an Emergency Fund- When you have money set aside for an emergency, there is less stress, less panic, and you can pay cash for it and move on with your life. Stay Out of Debt- If you have a lot of debt, unexpected expenses can send your finances into a tailspin. If you're out of debt, you don’t have to deal with debt collectors and payments on top of dealing with a stressful emergency. Have Insurance- I realize insurance can be expensive, but it’s a lot less expensive than not having insurance. At a minimum, make sure you have health insurance (here's a very affordable alternative). However, car insurance, home (or renter’s) insurance, life insurance, and even disability are necessary to head off any life changing emergency expenses. Question: Ever had an emergency that you weren’t financially prepared for? Leave a comment and tell me how you dealt with it. Personal Capital- Manage all your financial accounts in one place for FREE! Panicking is where a lot of people make their big financial mistakes. They think their back is against the wall and they make a poor decision out of desperation.